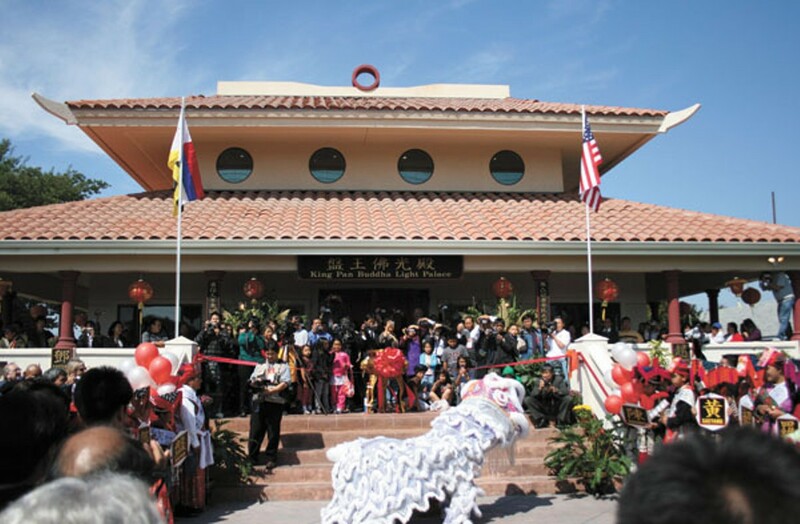 An ethnic minority comes together to celebrate the first Iu Mien temple in America. One thousand people showed up to the opening of the King Pan Buddha Light Palace. On a warm weekend in mid-September, some 1,000 people offered incense to their ancestors at a new temple in East Oakland, the same weekend that Catholics welcomed their new cathedral by Lake Merritt. Except here, the people were celebrating a religion much less well known. A modest-size temple by any means, the King Pan Buddha Light Palace on 105th Avenue in East Oakland is the first of its kind. There is only one other known palace for King Pan, the forefather of the Iu Mien people who originate from China, and that is in China's Hunan province, according to Kouichoy Saechao, chair of the Lao Iu Mien Culture Association in Oakland. "It's like a new chapter in our Iu Mien history," he said. The weekend celebration, complete with lion dancers and ribbon cutting, included Iu Mien visitors from Thailand, Laos, and France. The idea of an Iu Mien temple came about in the early '90s. According to lore, a shaman had an epiphany that the Iu Mien needed to build a temple in the US as a way to save their culture from extinction. In 1996, the Lao Iu Mien Culture Association bought the plot of land for $115,000, where the cultural center and temple now stand. The temple cost $750,000 to build and much of it was funded by the Iu Mien community, according to Saechao. In order to understand how significant the temple is, it's important to know Iu Mien history. In China, they are known as the "Yao" people, an ethnic minority of about 3 million throughout Southern China, though the Yao encompass several tribes, including the Mien. The Lao Iu Mien people, the specific name of the group in the US, have a shared history of migration from China to Laos. During the war in Vietnam, the CIA recruited them as part of the "secret wars" against communist forces in Laos. Thousands became refugees after the war ended in 1975, escaping first to camps in Thailand then scattered throughout — from the US and Canada to France and Denmark. Like the Hmong and Karen refugees, they are a people without a country to call their own, arriving here after forced relocation, ethnic purging, and wars. Oakland has about 4,000 Iu Mien refugees today — many of whom have become citizens. The largest population in the US is in the Sacramento area. To his knowledge, Saechao, 50, and his family were the first Mien to arrive in California in 1978. He learned the hard way, early on, that relying on his people and uniting the community was of utmost importance for this small minority. In the early '80s, he got word of a cheap plot of land in West Virginia. The majority of Iu Mien elders are farmers. So when the opportunity came up, he signed a lease on behalf of the Lao Iu Mien Culture Association: for $800 dollars a year, they would be able to farm on about 600 acres. Ten families relocated to the land, but things went sour just six months later after the owner accused the elders of working too slowly. Some believe it was racism or that there were unrealistic expectations. Newspaper articles on the story are part of a display in the basement of the temple. Eventually, the families moved back to the Bay Area. "We just wanted to be more productive citizens, to utilize our [farming] skills," explained Saechao, who cofounded the Mien association in 1982. "It's was sad, it was very sad. I think that really taught me a lot. Instead of looking for help from the outside, we need to look at ourselves within the community, how we can do things for ourselves." The new temple stands as a testament to that spirit, yet its celebration stands in marked contrast to the turmoil the Mien community faced recently when two local boys were wrongly accused of murder. Last year, seventeen-year-old Skyline senior Roger Saechao and his friend — both leaders of a Mien youth program — were arrested for the murder of Ichinkhorloo "Iko" Bayarsaikhan, a teenage girl shot and killed in Alameda on Halloween night. Roger's friend's father is also a board member of the Lao Iu Mien Culture Association. The boys were released, but not before their homes were raided, their grandparents harassed, and the ensuing media frenzy. Mien leaders helped advocate on behalf of the families and assisted them with translation. Several grandparents were at home during the raids and were traumatized when police arrived and pointed guns at them; the image reminded them of escaping Laos during war time, Saechao said. Roger's mom lost her job because of the publicity. According to several sources, Alameda police also pulled students with Mien last names out of class during their search for suspects, some as young as middle-school age. There are twelve common last names in the Lao Iu Mien community. Following the investigation, Saechao organized a Know Your Rights workshop. Several Asian and Pacific Islander groups also staged a rally outside of the Alameda Police Department, accusing them of racial profiling. Alameda police could not be reached for comment for this story. The events helped galvanize the community around the temple. Mey F. Saechao, 26, Roger's cousin, started working at the Mien youth program, which is part of the Asian Pacific Islander Youth Promoting Advocacy & Leadership in Chinatown. She brought a handful of youth to the temple opening, hoping that they'd learn about their culture. The temple is also helping to bring the Mien religion out in the open. According to Saechao, the religion's spiritual ceremonies — a combination of Taoism, Buddhism, animism, and shamanism — are typically performed in homes, led by a shaman or priest. In addition, ceremonies centered on the husband, while women and children played peripheral roles, said Seng Fong, 36, who coordinates a scholarship fund at the Mien association. "It's really hard for the younger people and women to practice our religion," she said. She hopes the temple will encourage more people to keep the traditions going. About a third of the Mien population has converted to Christianity or Mormonism in the last thirty years, she said. Fong also hopes to bridge the gap between generations. The Mien language, until recently, had no written form. It's now Romanized, but only the educated know it. Even at the temple, the written characters are in Chinese. The cultural organization also started a project to link youth with elders, called Generation to Generation. Many elders are depressed because they don't speak English or have a place to farm, though several Mien "urban farms" have sprung up in recent years in Oakland, Alameda, and Sunol. Younger folks are not only losing their culture and language, but getting pregnant, dropping out of school, and not attending college, according to those interviewed. At the temple opening, a young woman waited in a long line to burn incense as an offering to the deities and her ancestors. Elders and some of the youth wore traditional Mien clothing, including a turban-like head wrap that few in the younger generation know how to put on. Though the cultural center, located behind the temple, has been there for five years, it was Lai Saeteurn's first time there. "I want to learn more about my culture," explained the seventeen-year-old, who goes by Brenda. "As a Mien American, we don't get to learn about it in school. I don't understand most of it," she said. Is it possible that in one generation in the US, an entire culture can be lost? Not if the Mien community can help it.